We are a very lucky organization to have such a talented, and dedicated historian, Brad Moore. He is the president of the OPHS and it was his vision, along with our many dedicated members, that we opened the society's display in the JOCO Arts & Heritage museum and the models of our bygone years. 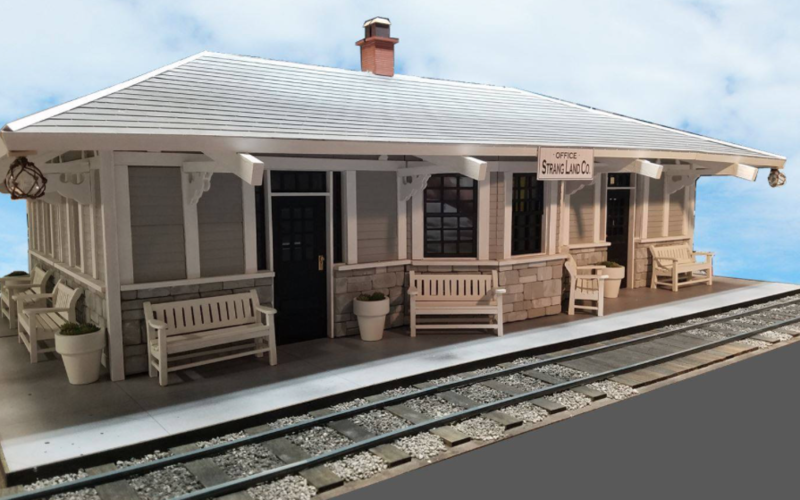 The Strang Depot was the very heart of our beginnings as the interurban railroad brought new customers from Kansas City looking for greener environments. It was in this building that William B. Strang, Jr., and his brother Robert, operated the new community in their office. Surprisingly, it was recently discovered that the original building, located on the SE corner of 80th street and Santa Fe. Currently the site of Suburb Decorations, portions of the original depot are still embedded within the walls of the building, including the hip roof. Take a journey through time, and your imagination, as this model comes to life. The picture here is the depot and trolley car, Ogerita. Photo courtesy of Images of America -Overland Park by Suzee SoldanEls Oberg. Purchase book here. Watch as the Strang Depot comes back to life with our video! Visit our Heritage models page for other displays!